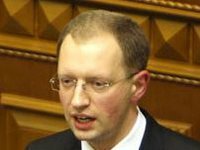 Ukrainian Prime Minister Arseniy Yatseniuk has said that today's breakup of the coalition has consequences, as the laws on filling the budget have not been passed. "Today's breakup of the coalition has consequences. Laws that would have filled the revenues of the budget have not been passed. This is understandable. Who wants to run in elections and simultaneously vote for unpopular laws?" he said speaking in parliament on Wednesday. Yatseniuk said that putting narrow political interest above the fate of the country was unacceptable. "It is a moral and an ethical crime," he said.